Prides of lions are on the rise in Merrushi area and causing serious problems. The predators are hunting cows and goats daily. 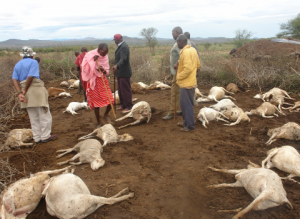 Samuel Ntauti, for example, lost 47 sheep and goats and one cow to lions in one single night. In the Maasai society losing a cow to a lion is equivalent to losing a saving account to a thief in the western world. Regular lion attacks have upset the locals, causing the warriors to retaliate. The warriors killed one lion that also attacked and injured one warrior. After receiving stitches from Merrueshi Village Center, the warrior was referred to Shalom Referral Hospital in Athi River town for x-ray and further treatment. One lion was killed while 14 others escaped to Chyulu Hills National Park. The warriors killed the lion when they realized that rangers from Kenya Wildlife Service failed to show up for help. 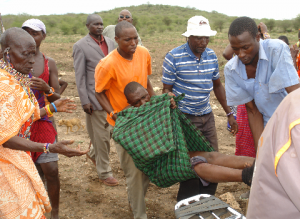 Muterian Ntika is being carried away by colleagues after a lion attack. The lion bit him in the leg.